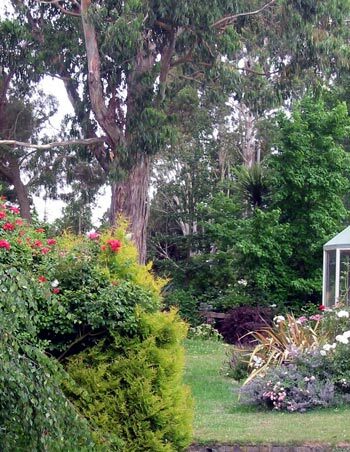 Standing in the car lay-by by the house entrance, there are sweeping views looking over the lawn towards the BIG GUM. These lawns are mowed regularly with a ride-on mower. The spidery lamp seems to grow out of the lime conifer in the car lay-by garden. 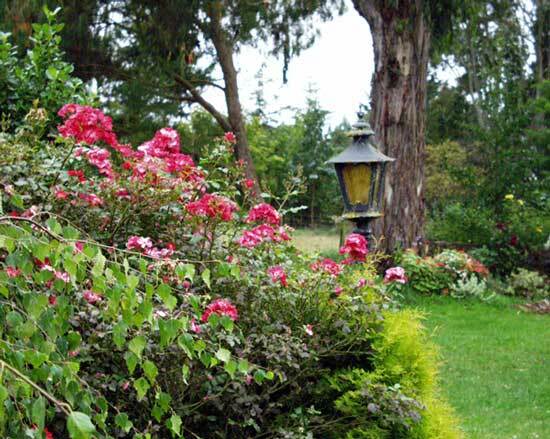 The deep pink bush rose is a favourite, name unknown. It repeats strongly throughout autumn until the frosts come. It's hard taking before and after photographs - the angles never quite seem to match up. I really thought I'd got this pair right! This picture was taken in the late Summer of the year 2003, and shows how the colour in the New Zealand flax stands out at this time of year. Right in the background you'll see the Berberis shrub with leaves already darkening - getting ready for Autumn. The catmint in the patio house garden is in full second froth - I do love this perennial, though it has times when it looks incredibly scruffy. I guess the BIG GUM has got bigger, but I can't tell the difference. It's a majestic beast of a tree to have in the middle of the house lawn, and keeps me busy dropping leaves, bark, and the occasional branch. We use the quaint phrase 'self-amputation' for this annoying characteristic! Over the years, one thing keeps cropping up. Visitors are always asking just how big this tree is. Well, it's difficult to fit it in a photograph, but here's my best attempt. It'll certainly stretch the page out a bit! Enjoy!